This blog was inspired by many conversations I have had with fellow wedding vendors regarding Instagram. Today I am focusing solely on Instagram because of its huge influence on the wedding industry. I will focus on a few items regarding “Instagram Etiquette”. Now I do want to warn everyone that I am no expert in this, these are just things I have learned in the last few years. 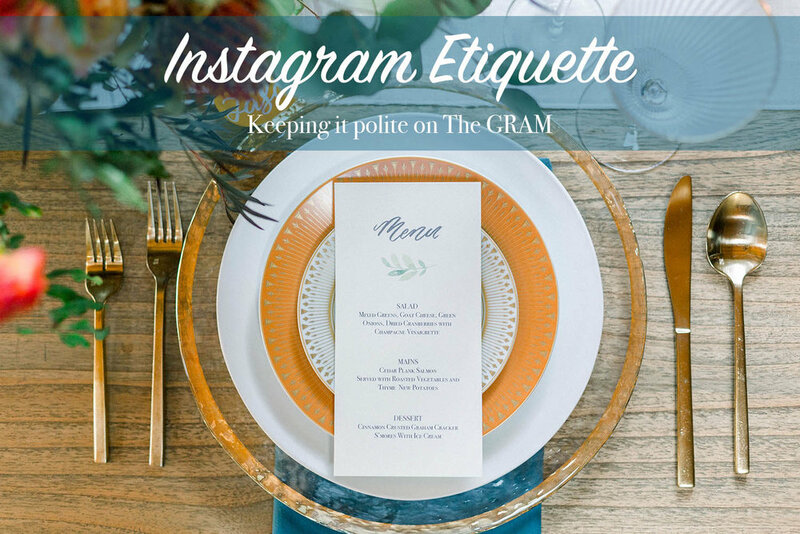 In fact, when I first started my instagram account for my business I had to learn A TON about etiquette. I made some big mistakes at first (which I will explain below) but I am thankful for the people who kindly corrected me. Rule Number 1 in my book, BE NICE! This is a general rule for life but being kind applies to social media too!! If someone upsets you and you cannot let it go, private message them to settle the grievance, don’t blast them on a public forum. You will only embarrass yourself and make yourself look bad! Instagram is all about filters right? If you took the picture yourself feel free to put any filter you’d like on it. However, if you are posting a photo that a professional photographer took it is proper etiquette to not alter the photo in ANY way! I made this mistake in one of my first ever instagram posts. I was part of a styled shoot and the photographer sent the photos to me to use for my social media. I took one of the photos and put a Gingham filter on it, cropped it to how I wanted and posted it. The photographer quickly texted me and asked me to please not alter her photo. I had no idea I was doing something that was wrong but I was so thankful that she told me so that I wouldn’t make that mistake again. Photographers spend a lot of time perfecting their craft and each photographer has a unique way that they edit their photos. 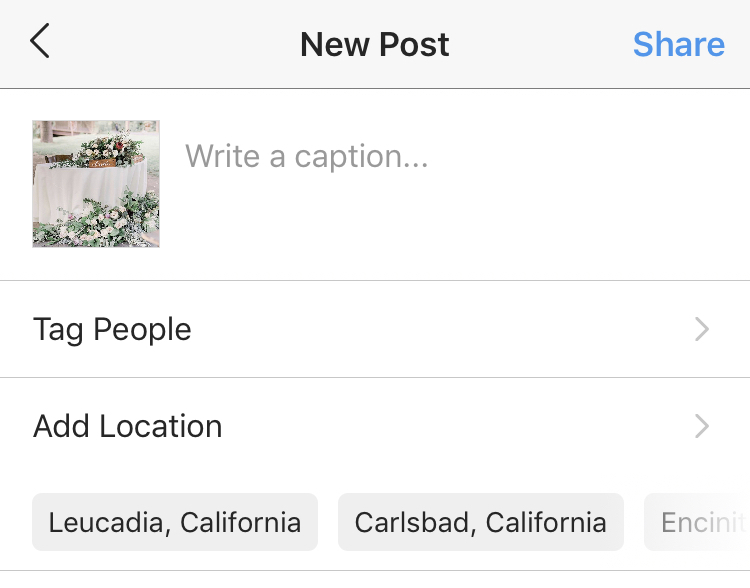 Therefore when posting a photo that someone else took, post it exactly how it was given to you, don’t zoom in or crop it, don’t add a filter, post it how it originally came to you and…. Rental Company: - In this case the rentals/linens were from the venue so you don’t need to add that since we already tagged the venue. Tag the vendors in your caption AND tag them in the actual photo. 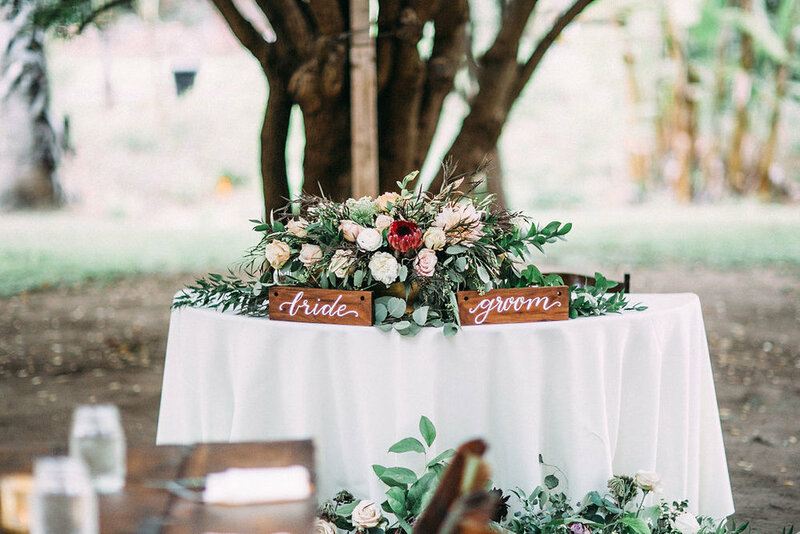 This was another lesson I learned about a year ago from a wedding planner. I tagged everyone in the caption but I had no idea what she meant by “Make sure to tag them in the photo too”. Tagging all the vendors on the actual photo makes the photo appear in the “tagged” section of their profile, which is really good for exposure. Below is a screen shot of where you can do this, it’s right after you upload a photo and then hit “next”. You are going to hit the “Tag People” button and then it will allow you to tap the photo and tag all the vendors involved. Some people hope to gain followers by following thousands of accounts and then unfollowing them. This is a very bad practice! The whole concept behind this is very self-focused, it’s all about gaining followers instead of gaining followers who actually want to follow you (aka your target demographic). It says something about you, your brand and it’s not something good. There is a local Realtor in my area that practices this method, he has about 12k followers (pretty good right?). He would follow and unfollow me about once a week, it was strange but it made it clear that this was his method to gain followers, and since I didn’t follow back he would unfollow me. I eventually blocked him and my impression of this person is not a positive one. The follow/unfollow game wrecks your credibility… don’t do it. If you find a photo on instagram that you love and you want to post it for “inspiration” the best thing to do is to ask the original account if you can repost the photo. If they say yes, make sure you tag all the vendors involved (if there were vendors) and give credit to the person who originally posted it. I am totally guilty of this one. When I first started my business I would ask questions to calligraphers who were killing it in the industry without a second thought. If they posted a story of them creating a wood sign I would ask “what pen do you use?” Now that I get these questions myself I shutter at the demanding nature of my original requests to these artists! I have no problem answering questions like these if they are polite and kind (In fact I am happy to answer them!). But I do have a problem when people aren’t polite. I have had people ask me multiple questions and never say thank you once. I mean COME ON … say thank you at least! I hope you found these tips helpful. Again, the reason I am sharing these tips is because I didn’t know them when I first started and I wanted to save someone else the pain!